trash: Trash all cards installed in or protecting this server and trace [X]– if successful, do 3 net damage. X is the number of cards trashed. Use this ability only during a run on this server. 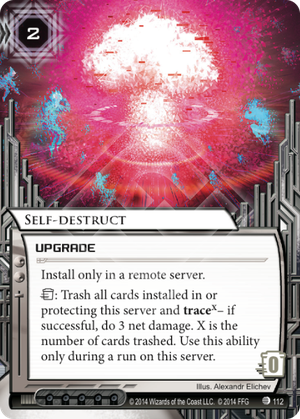 I find it amusing that although this card is called "Self-destruct," it will probably most-often be used more like an escape pod. Director Haas, Chairman Hiro, The Board, and whatever card completes the cycle when NBN gets a big box... they will all love using this card as a safety net to make sure they're never trashed while being accessed. The fact that it might also do some net damage is just a bonus. I guess if you think of trashing the server as literally just destroying the data (which is what it really is), it makes sense that all the top executives will make sure they can quickly wipe their sensitive data in case of an intrusion. Director Haas is never going to let you have access to her personnel file, even if it means destroying it to keep you away. If you want trolling, install self-destruct and advanced agenda(or ronin) together. When runner pass inner most ice, trigger it! Use jackson. But I recommend you use this card with director haas or chairman hiro. Yeah, using this with an executive seems like a good safety net. Director Haas sitting on a bomb handing out free clicks might be worth the risk of her getting trashed before installed. If you have deep pockets to pay for both a trace and to trigger Edge of World, it also might combo well and some throw away ice. I'm pretty sure that this card cannot combo with Edge of World. The EoW trigger is on access , so there is no paid ability window to use Self Destruct. If you try and use self destruct before access (which is the last time you have a chance to do it) , either the edge of world or the ice protecting the server would be gone. Therefore , edge would either proc for zero , or be trashed to the self destruct.